Upon arrival at Noi Bai Airport, pick you up and transfer to Hanoi center. Check in hotel and then free time at your leisure. Evening spend around 2 hours for a special tour to enjoy the street foods of Hanoi, follow by a water puppet show. Overnight at hotel in Hanoi. Morning pickup and leave by bus to Hoa Lu (2.5 hrs). Visit the historic capital of Vietnam and the famous ancient temples of Le and the Dinh Dynasties. Then our bus will transfer you from Hoa Lu to Tam Coc for lunch around at 12:30 PM. After lunch, boat trip to visit Tam Coc to see the beauty of the karst formations as you pass along their base and row into one of the many caves carved through the limestone. 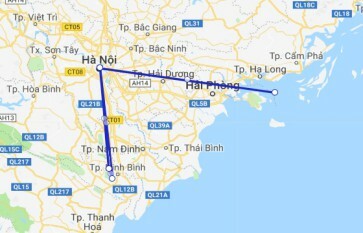 Drive back to Hanoi and drop off at your hotel around at 18:00 PM. Overnight at hotel in Hanoi. After breakfast, join a free walking tour with volunteer tour guide to explore Hanoi on your own with local citizens, not professional tour guide. Learn more about local lifestyle with our friendly guides. Highly Recommended. We had a great time on this activities packed adventure to Ninh Binh. Only 2 hours from central Hanoi, the magical area of Ninh Binh could easily be in another world. Called the Halong Bay on land the endless limestone formations capture your imagination above ground while another beautiful unspoiled world exists underground in caves and chambers visited by peaceful rowing boats. We enjoyed the vistas and the temples visits and bike riding along village paths and trails, stopping to say hi to smiling local folks and watching the wildlife. Afterwards we were welcomed at the newly built and comfortable bungalows and relaxed before enjoying a delicious BBQ dinner and “happy hour” drinks. All of the meals provided were generous and gave us an opportunity to try many tasty local dishes. We didn’t use the beautiful swimming pool on this trip but gee it looked inviting! Being only 2 hours there and returning the following day, this is a great trip for anyone seeking a different, quality, event rich experience outside of Hanoi, while on a limited time schedule. Loved every minute and totally recommend this experience. Just finished 4 days Ninh binh - Halong trip with this company. We had one day visit Trang An, Mua cave and 3 days in Legacy cruise finished in Hanoi. We were picked up in Ninh binh on time and everything was perfect. Food was tasty (and plenty), tour guide is friendly and knowledgeable. We had rain in morning but tour guide managed to visit a temple until it stopped to make us enjoy the boat trip (we love this flexibility). The cruise in Halong is 3 star and the routine was interesting to visit Lanha bay (we like it as Halong very crowded).